FREE SHIPPING: Specimental provides free Fed Ex Ground shipping in Canada and the USA. This takes 4-10 business days, has a tracking number, signature delivery confirmation, and basic insurance coverage value of $100. If you need two business day (to most locations, but some restrictions apply) delivery, please choose this shipping upgrade during checkout (Canada and USA only). This ring is made to your specifications upon ordering. The ring in the photos is sold- yours will be custom built for you by me, in my studio. 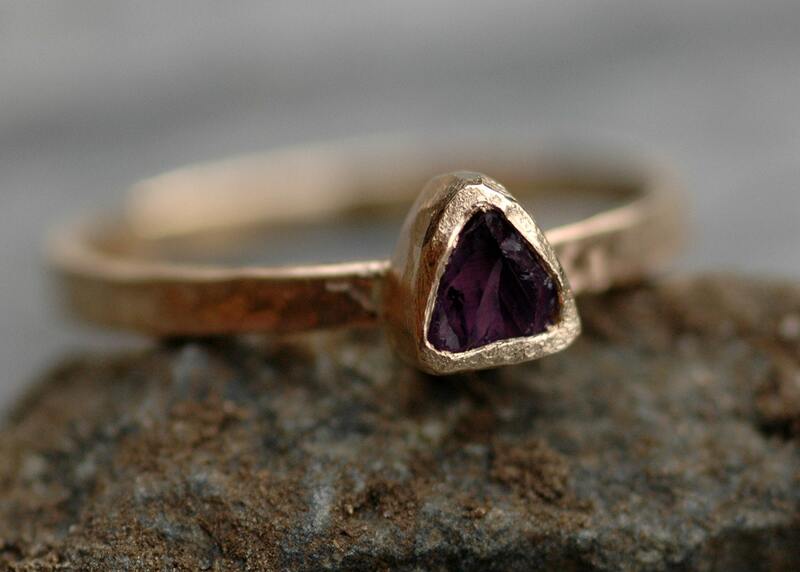 I have hand-cut this rich, deep purple Brazilian amethyst into a trilliant shape. 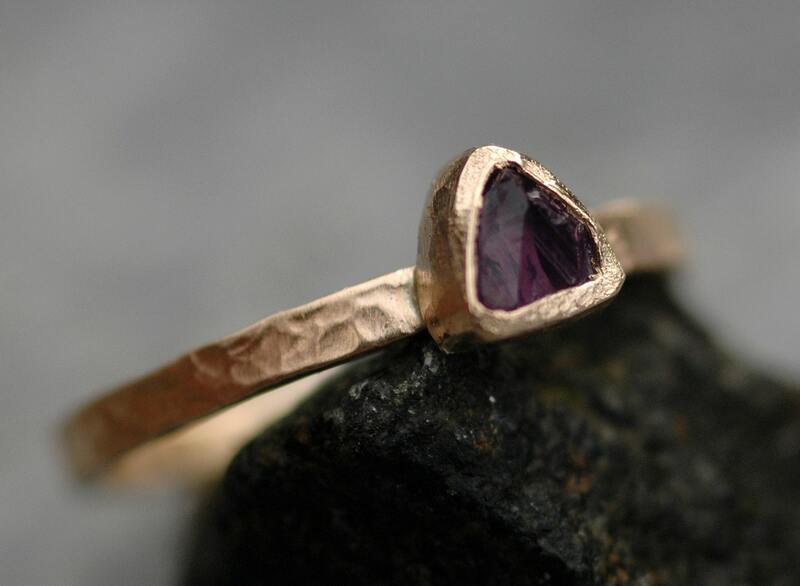 The amethyst was set into a hand-built bezel, and set onto a 2mm wide band. All of the gold is solid, recycled 14k yellow. You may choose rose, white, or yellow gold for your ring, in 14k or 18k. 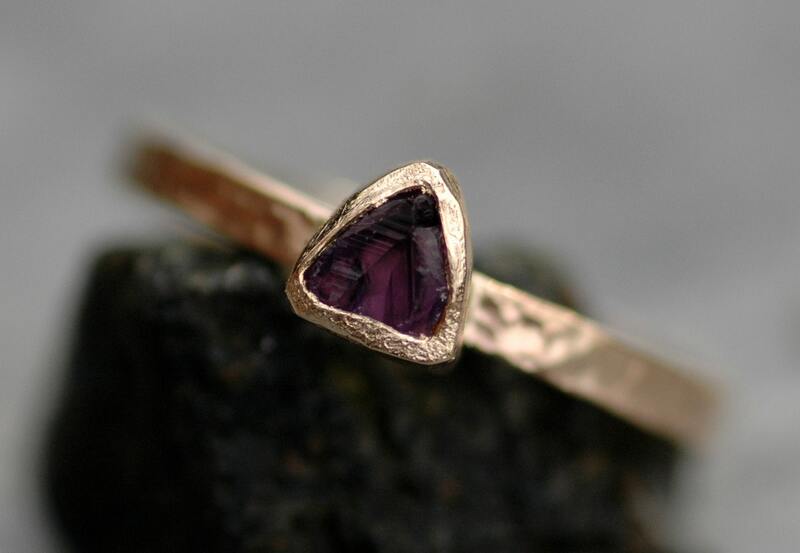 The bezel was given a geometric texture, to echo the surface of the amethyst. I can create a smooth bezel for your ring if you prefer. I accept Paypal (you don't need a Paypal account to use Paypal, just a bank account or credit card- follow along with the steps after you decide to purchase. It's really easy, and if you hit a snag I will help you out). I can process credit cards through Etsy's Direct Checkout service. Etsy Gift Cards are processed through Direct Checkout. I will accept international money orders- please be sure that these are the international kinds, as I am unable to negotiate USA (or other) domestic money orders, and will have to send it back to you if you send one in error. I can also accept personal cheques from fellow Canadians, but the cheque must clear prior to shipping. I can accept personal cheques from my American customers, but the waiting period for these to clear at my bank is 21 days. Work will not begin on custom pieces, resizing, etc. until after this waiting period, so please add that time on to the regular lead time. In Canada, you can send me an Email Money Transfer. Again, this is really easy to do. Finally, for those out of Canada, you can send me a wire transfer- just contact me for the necessary information. This method does incur an ten dollar charge on my end, which will be added to your invoice. I SHIP TO your Etsy address, unless otherwise requested. Please double-check that your Etsy address is correct. I generally drop packages to my shipping agent throughout the week. I am in Vancouver, Canada, so please keep that in mind if you are outside of Canada. Your piece will be insured as you request (up to a value of $1000, the highest-allowable amount when shipping from Canada), if different from what is in the listing. However, the declared value of your item will be listed on the import/export paperwork- this is the amount you paid for your item. It will be marked as 'merchandise', and not a 'gift'. I am NOT authorized to collect your country's import fees and taxes (unless you are in Canada or a few select American states), and they are not included in your purchase price. If you are unsure of the import fees/regulations for your country, please contact your local Customs office for precise information. The courier will collect your state/country sales taxes/fees either upon or after delivery via invoice. They will remit your fees to your country on your behalf. I always ship with a tracking number, and also use signature delivery confirmation wherever possible. ***Please choose the shipping option that will get your items to you when you need them- if you are having trouble deciding, please contact me through the shop and I will be more than happy to assist you. I will work with you to track down packages that go astray. I always ship with a tracking number, and also use signature delivery confirmation wherever possible. Please be aware of the amount your package is insured for- this information can be found in the listing from which you purchase. I cannot be held responsible for pieces that are lost or damaged in the mail, beyond their insured value. Please get in touch for an insurance upgrade should you wish full insurance. Please also be aware that it is not possible to have international jewellery shipments out of Canada (where I am located) sent with more than $1000 CAD of insurance coverage. If you would like this insurance policy on your shipment, you must let me know prior to having your item shipped to you. Get in touch for a quote on an insurance upgrade to your location. I do not provide refunds on any custom pieces. I always send multiple, detailed photos of your piece before I ship, so you can clearly see what you will be receiving. Please be sure of your commitment to your piece prior to purchasing. work are not refundable if work has already begun on your piece. Returns of ready-made pieces can be made, but you must notify me within two days of receiving your package that you wish to return. Shipping is non-refundable. All workmanship is guaranteed for a period of ninety days from the time you receive it. Should any problems occur through normal usage, I will repair it free of charge, including shipping both ways. Please note that if your piece is damaged due to rough wear or improper care, I cannot be held responsible for the damage. I will happily fix it for you if I can, but cannot pay for the shipping. Repair may incur a cost, depending on the extent of the damage. MAKE A MISTAKE WITH YOUR RING SIZE? I will build your custom ring to the size you give me. Please note that I am required to size up for wider ring bands- please do not do the sizing up for me. I need your accurate, true ring size from which to work. If you size up and do not tell me, your ring will be even larger than you expected. All ring sizes of ready-to-ship rings are stated in the listings. If I agree to resize a ring prior to shipping it, I will do so to your specifications, at no extra charge. However, if your ring does not fit the way you assumed it might due to an error in your estimation of your ring size, you may return the ring to me for resizing (shipping both ways is payable by you). There is a fee for resizing rings, which will be determined at the time you contact me. If you have any further questions about ring sizing, please get in touch with me through my shop. The best way to get your ring size, other than having a jeweler measure your finger, is to measure the inside diameter of an existing, well-fitting ring. This needs to be done very specifically, to the fraction of the millimeter. Wider banded rings will be built approximately 1/4 to a full size larger than your ring size- this will ensure for a more comfortable fit. Please DO NOT 'size up' on your own- I need your true, accurate ring size to work from. WHY BUY YOUR RAW DIAMOND RING FROM SPECIMENTAL? A raw diamond is an exceptionally difficult stone to set properly. 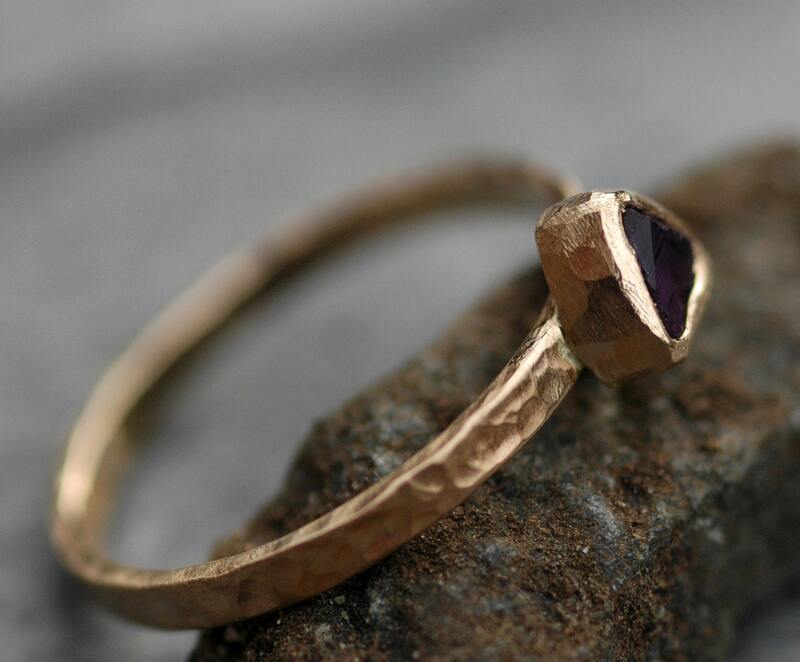 Their unique shape means that a custom setting needs to be fabricated for each and every stone. The way in which the setting is closed around the diamond must be approached in a very particular fashion. I began setting these stones into my rings in 2009, when only a small handful of jewelers were working with this type of stone. As the appeal of raw diamonds has exploded, countless numbers of jewelers are now incorporating them into their designs. I have set thousands of raw diamonds into my pieces since then. Please check out my client feedback, as a testament to my workmanship and design skills: https://www.etsy.com/ca/shop/Specimental?ref=hdr_shop_menu#reviews These reviews are just a sampling of the positive feedback my work has received- many more clients choose to contact me privately with their feedback, and to not use a public feedback system. Our hands are busy objects, and any ring worn on a finger can become accidentally damaged. All rings need regular maintenance. Make sure you are buying your raw diamond ring from a jeweler with the knowledge and experience needed to ensure your stone stays put. Ask them about their warranty and their repair/upkeep policy. Look at how frequently they work with raw diamonds, and assess whether they have the technical experience to create a ring that will last your lifetime. I stand behind each piece of jewellery I make. If something goes wrong with your ring, at any time- you slam your finger in a drawer and crush the band, you break a prong, you smash and crack your stone- you can count on me to support you with the repair. As a single mom/only parent, this business is the sole way in which I support my three young children. I take the running of my business very seriously- our livelihood depends upon me providing you with the best built, best designed piece of jewellery possible. All of my jewelry is solidly constructed. However, any jewelry requires care- do not clean the ring with anything other than water, should the need arise. Please do not allow silver cleaner to touch the specimens, should you choose to use it. I don't use it myself- instead, I clean my gold and silver pieces using a special silver cleaning cloth. It is impregnated with fine garnet powder, which is a mild abrasive- so, please do not rub the specimen with the cloth. Of course, your specimen will not enjoy being banged on a hard surface, and could fracture if you do so. Please wear with care. If you treat your specimen right, it should last you a lifetime. Please also note- due to the transparent/translucent and reflective or refractive nature of some of these materials, the type and intensity of light you view them in can affect their appearance- this changeable quality is part of what makes them so lovely. CUSTOMS FEES: I am shipping from Vancouver, Canada. Any customs fees, import taxes, duties, tariffs, etc. charged by your government are not included in the selling price nor the shipping cost in my shop. Please be aware of any extra costs your country may charge you for importing pieces from Canada. I love creating custom pieces. I especially love creating custom pieces with your personal stones, specimens, or other little curiousities. I am always open to hearing your design ideas. Please contact me through the shop, or at treloar@telus.net to discuss design possibilities. If you are unsure of your ring size, the best way to be sized accurately is by visiting two commercial jewelers. Please ensure they size you using their thin sizing tools- not the wide band sizing tools, nor by having you try on rings from their display. All of my pieces come ready to present as gifts, in attractive foil stamped jewelry boxes, enclosed in a velveteen gift bag. If the person for whom you are purchasing the piece shares your address, please be aware of the following: International export law dictates that the detailed contents of packages, and their value, be clearly marked on the outside of the package. This means that if they see the package before you do, they can easily tell what they are being gifted with. Need secrecy for this delivery? The very best option is to have your package held for you at your closest Fed Ex store- if you are unsure of its location, I'm happy to help. What about repairs and upkeep of your new jewelry- how does Specimental provide ongoing customer support? My gold is all recycled- the metal plant I purchase it from has been in business for over 100 years. They smelt their metals to the highest environmental standards, to cause the least impact on the environment. They do not deal with newly mined metals, as these metals cause much greater destruction to the environment. There is no visible difference between recycled metals and newly-mined metals. There is also no difference as far as the karat of the metals go- 18k recycled gold is exactly the same in constitution as 18k newly mined gold. The vast majority of my clients prefer their metals recycled, as environmental impact is of concern when choosing the perfect piece of jewelry. Can Specimental reuse my old stones and recycle my gold? I can use your heirloom stones in a new design. The stones must be pulled from their settings and checked for stability by a professional jeweler prior to shipping them to me. I cannot recycle your gold. I am not set up to smelt gold in the studio, so am not able to melt down your old gold pieces for you. Depending upon my work and family schedule, I am happy to accommodate your rush orders. There is no additional charge for a rush order. However, please do get in touch prior to ordering to discuss your deadline with me. 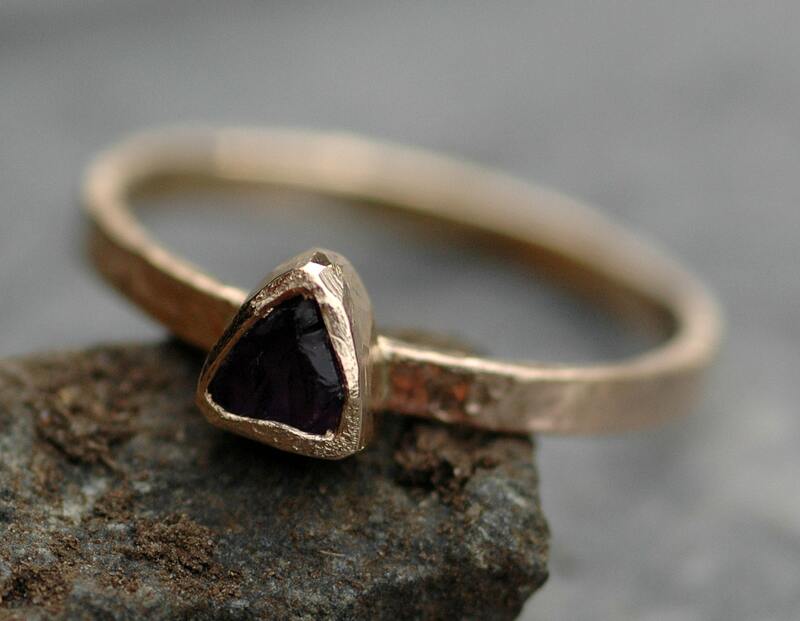 Can I order a ring with a different stone, wider band, different texture, or in a different colour/karat of gold? Yes! All of my pieces are completely hand fabricated in the studio by me, from raw materials. I am able to create any of my designs with any stone, in any composition. In short, you can have your ring absolutely any way you like it. Contact me through the shop, or via treloar@telus.net to get the discussion around your perfect piece of jewelry started.